Aromatic truffle oil and parsnip chips complement this ready-made soup beautifully. 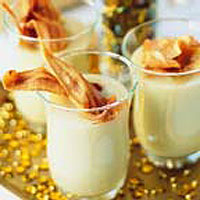 Serve in shot glasses, with the leftover parsnip crisps on the side, if you like. Heat the soup in a medium pan, according to the pack instructions. Pour carefully into 8 shot glasses. Top each shot with half a teaspoon of truffle oil and parsnip chips and serve immediately.